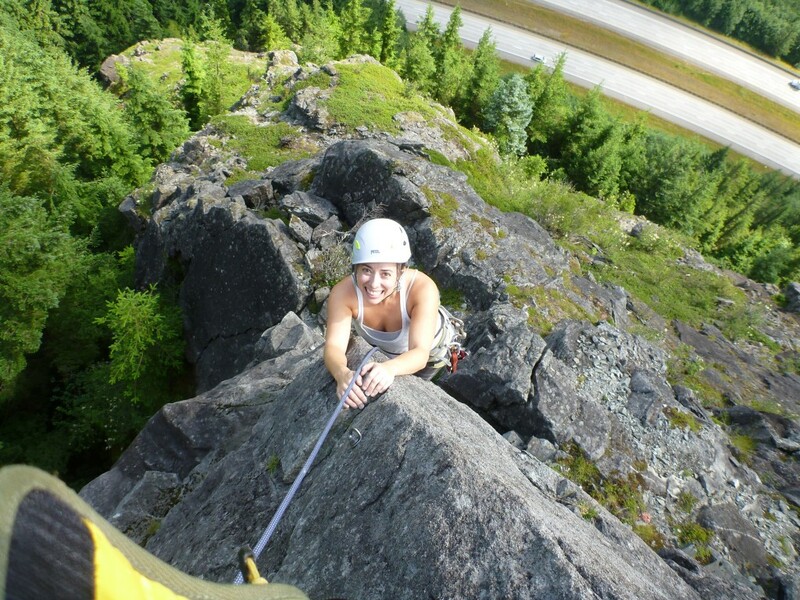 Sue, Crystal and I climbed at Exit 38 yesterday. We met Crystal 3 years ago in Joshua Tree. She has moved up here for her job. It’s awesome to climb with old friends. 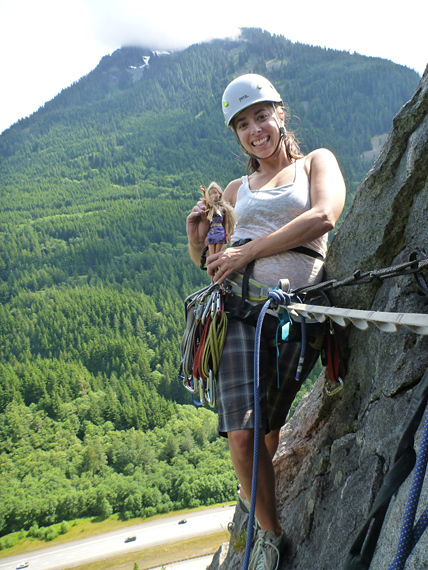 Crystal has a mascot called Climbing Barbie. Barbie has a climbing harness of her own, with tape gloves and painted on climbing shoes. Barbie is tied to Crystal’s harness. We climbers are proud of our eccentricities. We got on some hard routes yesterday. I got up a 10a, but the 10b Crystal is on did not go well. I had to rest on every bolt, and at the crux, there was a 20 foot run out. It looked like the climbing was easy enough up to the next bolt, but you never know. I did not have any beta about the route and this sport is dangerous enough without venturing up into unknown territory. I chose to back off rather than risk the fall. When we rapped down I discovered that the reason there was a run out was the holds were good, no harder than 5.6. Next time I will run it out. I’m thinking I will continue to practice the guitar, but I’m going to work on some instrumentals…possibly accompanied with my harmonica. Lots of guitar players are very good, but they don’t sing. I thought I had the possibility to be both, but after listening to my recording…I realized I need to focus on the guitar, and forget about the voice. And that’s ok, I love the sound of my old Martin. Sue and I went to the Open Mic at the Antique Sandwich shop in Tacoma. There were at least three very talented singers there in the hour that we stayed. There were also quite a few who were just everyday folks experiencing the thrill of performing before a crowd. The crowd was very respectful and applauded every performer, regardless of experience or talent. I walked out thinking that it would be a good venue for my modest talents. Tonight I got out my microphones and recorded myself playing guitar and singing. I knew I needed to get used to the double microphones used on acoustic guitars. When I played it back on our stereo speakers I was shocked. I am off key, creaky, off tempo and generally an all around terrible singer. Sue has been telling me this for years. I guess I’m kind of like those people who do karaoke. While they are in the moment, singing along in the bar, it feels so good to be the singer. But to people listening to their untrained voice…not so much. I’m kind of bummed about this. My emotions are telling me that I am singing beautifully, but when I listen to the tape objectively afterward, yikes. Apparently I would need to take voice lessons for a while to learn how to sing. Maybe someday in the future when I have more free time. A better plan is to switch hobbies and start painting again. It’s almost mid summer and I haven’t touched my easel yet this year. Fletch, Lisa and I spent the day at Index climbing RattleTale Crack. They had never been to this awesome crack up by Private Idaho. I’ve posted the trip report here. I may post it in true wordpress form here later.